Long time readers of my blog know how much I love the Logic of English. 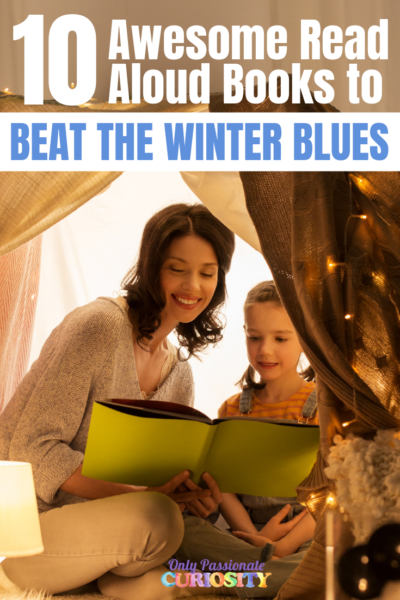 This program really saved my sanity with my kiddos, after trying just about every reading program on the market. Not only that, but it changed my life; finally teaching me to spell after being told my whole childhood that I would always be hopeless when it came to spelling. We are long time fans of this curriculum, and are one of the success stories who started using this curriculum when it was brand new on the market. 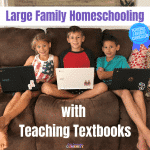 I begged to be given the chance to review Logic of English Essentials with the Schoolhouse Review Crew, because I wanted to be given a chance to share this amazing program with even more homeschoolers. I really feel this is a program all parents should be aware of, because it’s a game changer for families with kids trying to learn to read and spell. The Logic of English takes the English language with all it’s intricacies, and breaks it down into it’s smallest, logical parts. Words are taught by building them from their smallest sounds and are explained with rules that make sense. Using this program, 98 percent of English words can be taught explicitly and explained logically. There is no guess work or memorization of whole words here. When I teach my kids, or use this program as a basis to help other kids, I always tell them that I am teaching them a “secret code.” This “code” will explain all those tricky words, so any new word you come across, you can figure out. Written words can be read with ease, without guess work, because you know the “code.” Words you hear can be written, correctly, the first time, because you’ll know how to break them down into their smallest parts (the phonograms) and glue them together again. So what is The Logic of English Essentials Curriculum? The Teachers Manual: The Teachers Manual is huge (over 500 pages huge). It contains schedules, easy to read charts that sum up everything, instruction on improving phonemic awareness, and the lessons themselves. The Workbook: The workbook is also huge (even though you can buy a PDF, it’s probably cheaper to buy this bad boy printed because of it’s size) and has all the lessons and activities with nice big lines for kids of all ages to write on. Part One: New phonograms are introduced. 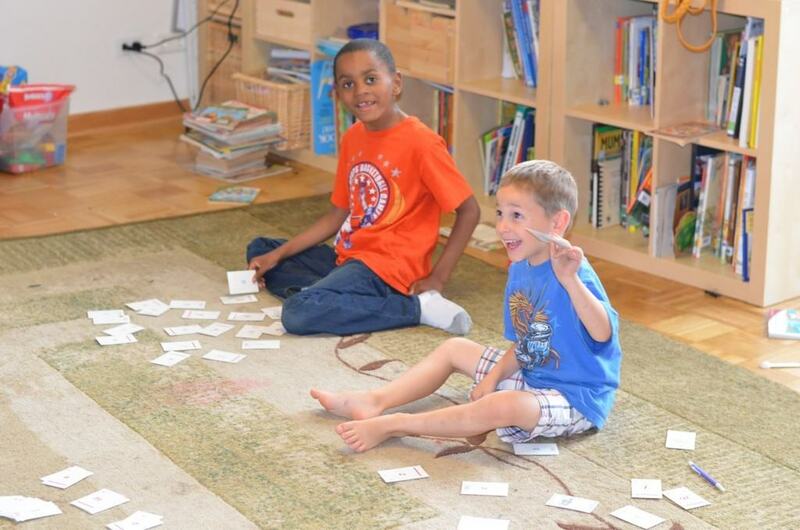 The Child reviews old phonograms, and practices with a little verbal phonogram dictation. They will both see, and then say the phonogram, and hear and then write the phonogram. Then, you explore sounds with your child. Each week, there is a different topic. You’ll look and long and short vowels, syllables, and other things. Then, you learn about the applicable spelling rules for those phonograms and sounds. There are lots of multi-sensory ideas and suggestions for you to practice these phonograms and words more (including suggestions to use the game book and spelling journal). Part Three: Contains grammar instruction, Dictation of phrases, Composition, and Vocabulary development. The basic phonogram cards: Includes all 74 basic phonograms, with the pronunciation key and examples on the back. This is the recommended set of resources Logic of English suggests you have to use this program. Other supplemental materials for Essentials include the Spelling Journal (a resource for a student made spelling dictionary by phonogram), Grammar Cards (with the grammar rules clearly defined), Advanced Phonogram Cards (for foreign based phonograms- includes the country of origin and pronunciation key), and a third set of game cards (blue bookface). What if I need help pronouncing the Phonograms? There’s an App for that! When you first open your package of goodies from Logic of English and sit down with those phonogram cards, it can be overwhelming. I speak English just fine, but learning the phonograms takes precision. I needed to be able to pronounce them correctly, so I could teach my kiddos correctly. 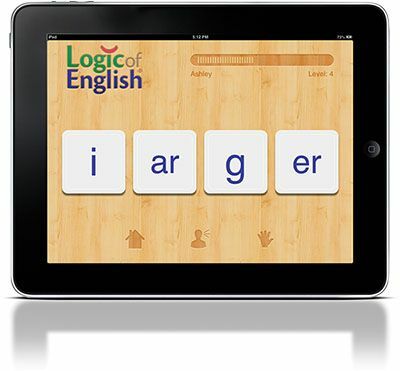 The Logic of English App is a really handy tool because it has two modes. Speaking the Phonograms: On this mode, all the phonograms are laid out on the screen, so I can click on any one of them, and Denise Eide will read the sounds to me. I use this mode if I am ever unsure of a sound, and I have it open both when I do flash card review with the kids, and when I am giving the kids dictation with the phonograms. I can simply click on the one I need, and know I have the right sounds, in the right order. After a while, you’ll know all the phonograms like the back of your hand, but this is a wonderful tool while you are learning! Playing the Phonogram Game: The App has a quiz mode, where the app reads the sound, and the child has to click on which of the 4 shown phonograms they are hearing. It progresses by level, introducing phonograms as they get more and more challenging, and more and more rare in the English language. It Works. I was skeptical at first about it’s claim to be able to explain 98 percent of English words, but now that I know the rules and phonograms myself, I’ve really been able to figure out any of the words I struggle with in a logical and easy to understand way. With the kids, I can easily help them spell something when they struggle. Bug will ask me “how do I spell…” and I can say “humm…. lets see if we can break it down into phonograms and figure it out.” We know what phonograms can be used where, and when they follow short vowels, and how the syllables make a difference in the spelling. It’s Easy to Teach. The format is always the same. The lessons have a rhythm to it, and each lesson in the teachers manual is clear. When there is a particularly challenging word, Denise Eide has anticipated it, and provided you with clear instructions to handle it. 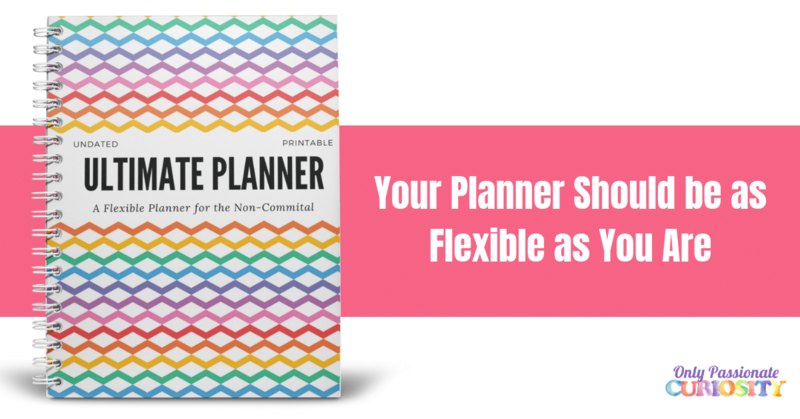 The game book and workbook make it easy to open and find what we need to do. It is Fun: This program doesn’t get boring. There are tons of games to play. If my kids are bouncing off the walls and don’t want to sit down, they don’t have to. We can find active games to practice, and card games to play. We can include friends, and younger siblings. The Teacher Support is Phenomenal: Denise Eide has provided a full teacher training seminar for free on YouTube so you can fully learn how to use this program and get the most out of it. If you have questions, The Logic of English is quick to respond and helpful on their Facebook page. It Can Grow With You: This program is one that can be used again and again. 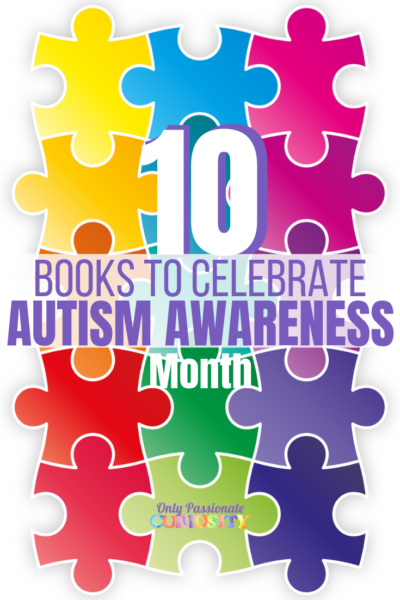 The first year we used it, I only did part 1 and 2 of the lessons, focusing on reading. This year, we are doing all 3 parts, with a focus on spelling mastery. Next year, we’ll do it again, using the advanced list available on the Logic of English website to spell more complicated words. It’s Complete: You don’t need to buy 8 levels. You need to buy ONE book. One. This book will give you all the tools you need to spell well. You can apply what you learn here to any spelling list you find. After this program, all you need to do is move on to a latin/greek root based vocabulary program, and keep practicing the code you learned through the Logic of English. That’s it. This program is one I think all homeschoolers should check out. 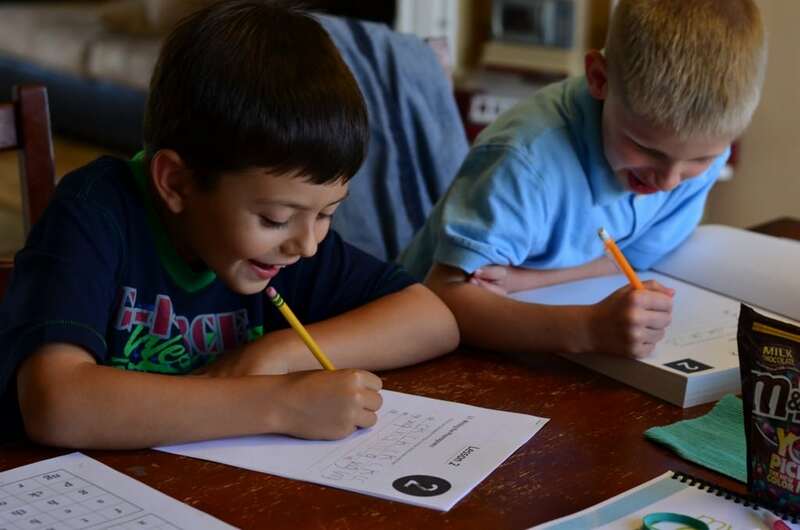 It is the most clear and comprehensive phonics based reading and spelling based program I have seen on the market, and is one I don’t think you’ll be disappointed in. It does have a learning curve, but Logic of English has provided you with all the tools you need to be a successful teacher with this program. All the materials are high quality, and most can be used with all your children, again and again. While this book is written for third graders, the schedules, advanced lists, and other tools provided make it appropriate for all grades. This program is the gold standard for reading and spelling. Wow! We reviewed the Rhythm of Handwriting, which was also very thorough. Essentials looks amazing, too! I love how they break it down. I think our kids would do well with that. We’re not starting our “new” school year until the new year, but I might have to look into this more! WHAT?! There’s a YouTube seminar? Get out. I’m definitely watching that.